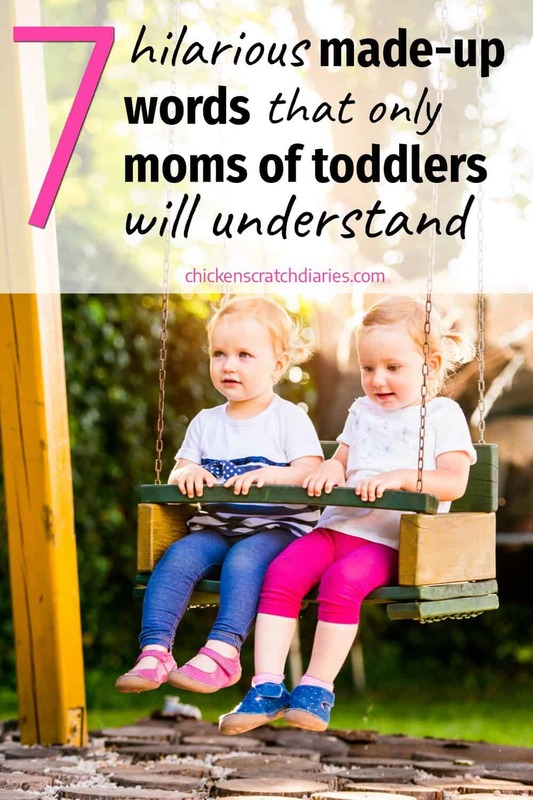 There are certain things that I took for granted before I had kids. Hot food. Consecutive hours of sleep. Books without pictures. Sometimes we don’t realize the life of luxury we previously enjoyed until those privileges are stripped away, leaving us with four-day-old hair and a weird fondness for goldfish crackers. And speaking of missing out on good books the last few years, I’ve noticed something alarming happening in their absence. I have added several new words to my vocabulary that never had meaning to my pre-kid existence. Words that weren’t even on my radar (or didn’t really exist) have become a part of my everyday vernacular, either out loud or in my head. So in the event that you need some handy definitions for your running commentary, I’ve decided to compile a list of my top “mommy-isms”, if you will. 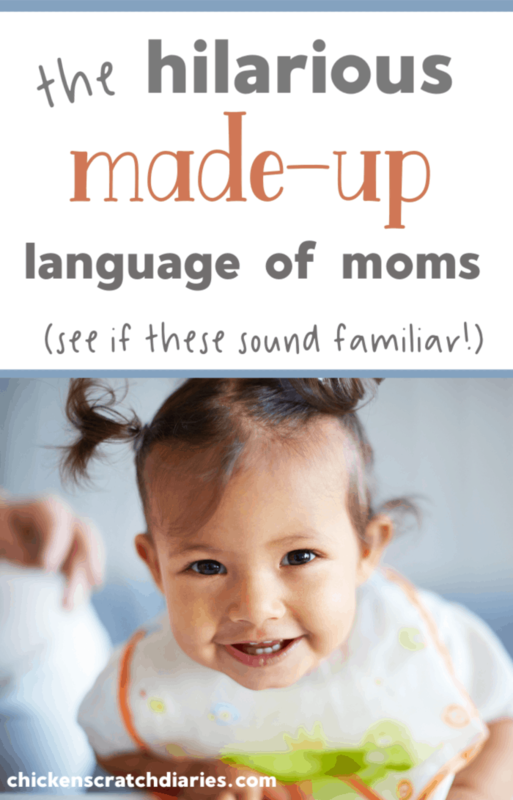 If you haven’t quite found the words to describe motherhood, maybe you’ll find a few of them here. 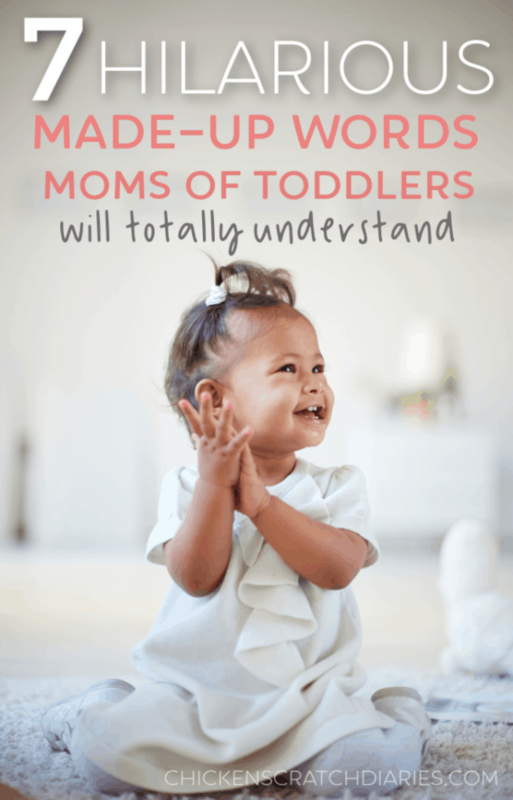 If you’re a mom, particularly a mom of littles, you will probably know what each of these terms or phrases mean, even though you won’t find most of them in any proper dictionary. No, not decaffeinated. Uncaffeinated, as in, “Call me back in a few hours, I can’t think while I’m uncaffeinated.” This is really true by the way. Don’t call moms before at least the second cup of coffee if a coherent response is required. Banana-pants are my go-to wardrobe staple these days. You might have a pair too. 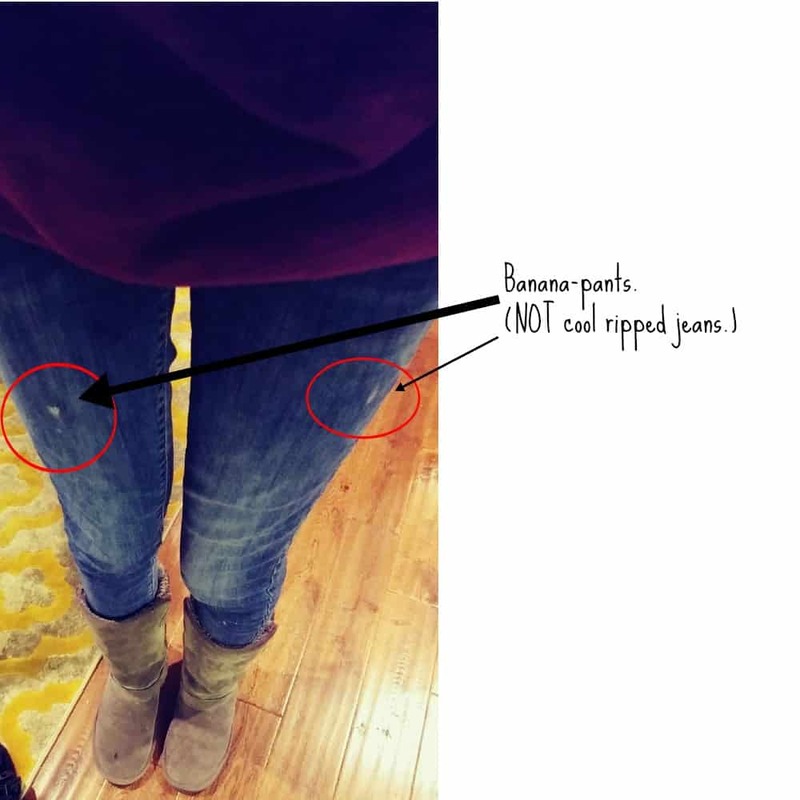 I’m talking about that sticky crust of dried banana-slime (mixed with snot usually) that forms about mid-thigh on your jeans from your toddler’s clingy grip all day. “Buddy, it’s time to pick up the big girls from school. Go get your shoes while I change out of my banana-pants.” Except in real life, I rarely have time to change them nor do I care. I used to take showers. Now I get the abbreviated version while utter pandemonium breaks out in the other room the moment I turn on the water. And if there’s no pandemonium, I lather up even faster, thinking they’ve all choked on their breakfast at the same time. Yes, this is a real word we’ve all come to know and love. Athleisure and banana-pants complement each other quite well. However. Maybe I’m being a bit paranoid here…but doesn’t it sound like an oxymoron that’s hilariously targeted at mothers of young children (who shop at Target)? It’s really genius if you think about it – a line of clothing that allows you to feign athleticism without *actually being athletic*. Because who has time or will in the foreseeable future? Not this mom. I will say that athleisure is a step above the yoga-pant-cult of previous years, but seriously? We all know there’s no “ath” happening in those leisure pants, unless hurdling over sippy cups and Lego forts qualifies. And if that’s the case, I suppose the next generation of glorified sweatpants will be called “olympi-leisure”. Which actually do sound kind of inspiring, like I have goals or something. There are days that I miss having goals. I definitely miss books with real words. But someday, I’m sure I’ll miss my banana-pants even more. ha! 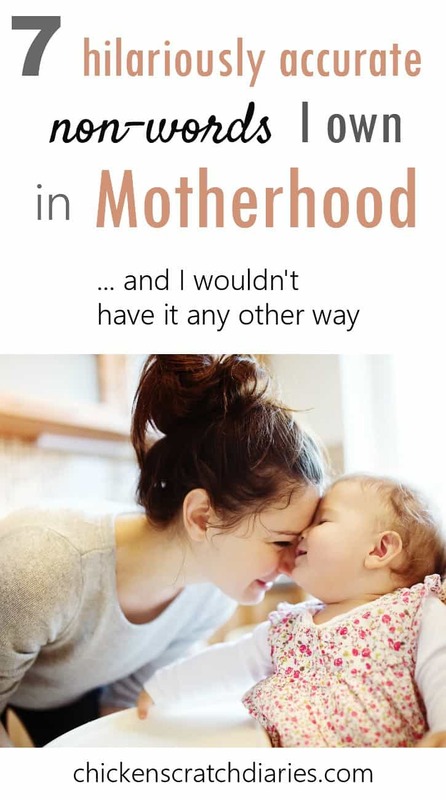 Motherhood must be a universal language then. Thanks for sharing Sabrina! This is hilarious, and I laughed out loud (at least I think I did) at #5. I do that EVERY. MORNING. I think. Idk, I’m so perma-tired right now I can’t remember if I washed my banana-pants today or not because I’m gonna need them tomorrow. 😛 Yay for Mama-hood solidarity! 😉 Pinning! Did someone say “Han-a-tizer?” ?? ?